PhaseNyne (parent company of Women’s Executive Network – WXN, Canadian Board Diversity Council – CBDC, and Stevens Resource Group – SRG) is proud to announce this year’s Diversity 50 (D50) cohort – a list of highly-qualified and diverse candidates in search of corporate board roles, which could help Canada’s largest companies source the top-level talent needed to compete globally. Now in its sixth year of production, Diversity 50 is an initiative supporting PhaseNyne’s mandate to increase representation of such considerations as gender, visible minorities, Indigenous persons, people with disabilities, and members of the LGBTQ community at the boardroom of Canada’s 500 largest organizations. The goal of the list is to bring together and turn the spotlight on qualified candidates who are typically overlooked or unknown to recruiters and Nominating and Governance Committees. This year, the Diversity 50 list is comprised of 44 females, 6 males, 15 visible minorities, 2 individuals that identify as members of the LGBTQ Community and 1 individual that identifies as a person with a disability. This year’s candidates hail from Canada’s largest cities, spread across six provinces: Ontario (66%), British Columbia (16%), Alberta (8%), Quebec (4%), Manitoba (2%), and Saskatchewan (2%), and 2% are expats. Notably, 30% of this year’s Diversity 50 list is comprised of visible minorities, which is an increase of 12% from 2016 and five times more than the number of visible minorities currently serving on FP500 boards as directors – according to PhaseNyne’s 2017 Annual Report Card released in December of 2017, only 4.3% of directors self-identify as being a visible minority. 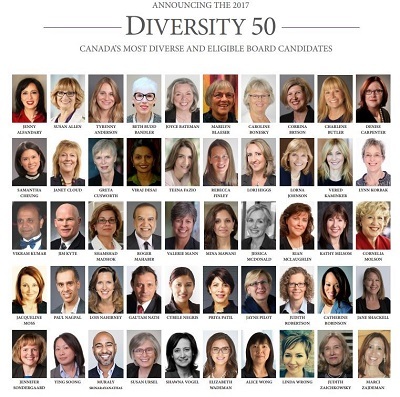 To select the Diversity 50 2017, the Council vetted the list through a process endorsed by 24 participating CEOs and executives (Diversity 50 Champions and Proxy Committee members): Managing Partner, Talent & Workplace at Deloitte Canada Miyo Yamashita; IAMGOLD EVP & CFO Carol Banducci; Shell Canada President Michael Crothers; Sun Life Financial President Kevin Dougherty; Goldcorp President & CEO David Garofalo; Postmedia Executive Chairman & Chief Executive Officer Paul Godfrey; TELUS Senior Vice President, Client Experience Arleen King; CIBC Managing Director & Head, Loan Syndications Chint Kulkarni; Teck Resources President & CEO Don Lindsay; FedEx President Lisa Lisson; Former Coast Capital Savings COO Kathy McGarrigle; Freshco Blue Collar CEO™ & Founder Mandy Rennehan; Suncor President & CEO Steve Williams; Coast Capital Savings Chief People Officer Tracey Arnish; Deloitte Canada Director, Future of Canada Centre Farah Huq; CIBC Senior Director, Gender Inclusion Jennifer Laidlaw; Suncor SVP & General Counsel Janice Odegaard, TELUS VP People/Culture Debbie Oster; Shell Canada General Manager, Groundbirch & Operations Technical Support Shannon Ouellette; IAMGOLD VP Ops, Finance & IT Effie Simanikas; FedEx VP Operations Pina Starnino; Goldcorp VP Diversity, Regulatory Affairs & Corporate Secretary Anna Tudela; Frescho Bear’s Strategic Expert Katrina White; and Teck Resources VP, Human Resources Dean Winsor. For more information about CBDC, please visit boarddiversity.ca. PhaseNyne (parent company of Women’s Executive Network – WXN, Canadian Board Diversity Council – CBDC, and Stevens Resource Group – SRG) provides the tools and resources to help corporate boards boost their diversity efforts, including the annual Diversity 50 list, which features a cohort of 50 diverse, qualified candidates ready for corporate board director appointments. Additionally, PhaseNyne’s Get On Board Governance Education Program is designed to complement existing director education programs, equipping board-ready, high-potential diverse candidates with the tools to pursue board placement. The company is also known for their Annual Report Card (ARC), which is produced in collaboration with the Conference Board of Canada and tracks and examines diversity in Canada’s boardrooms. Subscribe to our FREE online news service dedicated to producing essential up to date news for the construction, building, and design community. Established in 2003, Construction Links Network is a peer-to-peer network sharing platform for the construction, building and design community. This one-of-a-kind platform provides the tools necessary to source and distribute the latest news, videos, events and innovative products / services the industry has to offer which helps our members plan, design and build great projects around the world.